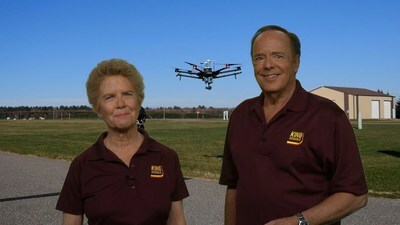 John and Martha King are the instructors in the King Schools drone course version 2.0. The course prepares customers to pass the FAA Unmanned Aircraft Systems Knowledge Test. SAN DIEGO and DALLAS, May 12, 2017 /PRNewswire/ -- AUVSI XPONENTIAL Conference -- Drone pilots who want to fly their drones in furtherance of a business have a fun and quick way to prepare to pass the required Part 107 Remote Pilot Certificate written test with Version 2.0 of the King Schools Drone Pilot License Test Prep Course. John King, Co-Chairman of King Schools, said, "Since it was released in January of 2017, over a thousand drone operators have passed the test using version 1.0 of our course. We have more than 70 reviews for this course and almost all of them have a 5-star rating. One drone course taker, Jennifer U., commented that 'The course was so much more enjoyable than reading the manual. It helped me remember the information through acronyms and other fun educational measures.' Version 2.0 will be even more of what they tell us worked so well for them. We've added more humor, video and graphics to make things clearer and more fun." Martha King, the other Co-Chairman of King Schools, added, "Probably the most difficult subject on the Knowledge Test for the Remote Pilot Certificate is airspace. That's where our 33 years of experience in teaching with video really pay off. Learning drone pilots will see a 3-D recreation of airspace so when they see it on a 2-D sectional chart, they will be able to visualize it in the air." "We are thrilled to bring techniques that we have developed over the past decades of simplifying and clarifying these concepts," continued John, "to help drone pilots truly understand and safely participate as partners in our national airspace system. New users and current owners of our course will also enjoy all new HD-video in the regulations lesson, interactive FAA-style questions and extended content throughout the course." Martha King commented, "This new version of our course is a reflection of our policy of continually updating all of our courses. We expect the drone course will be updated frequently since the drone industry is in such a state of flux and the FAA is scrambling fast to keep up." Current course users need not worry about information expiring since King has a policy of automatically updating the courses of all current customers. The King course gets drone pilots ready to pass the FAA test and gives them the tools they need to both safely integrate into the National Airspace System and stay out of trouble with the FAA. The course is the result of collaboration between King Schools and the Association for Unmanned Vehicle Systems International (AUVSI). The King Schools online Drone Pilot License Test Prep Course can be purchased at an introductory price of $99 until July 1, 2017 from KingSchools.com or by calling (800)-854-1001 or worldwide at +1 (858) 541-2200.